Since writing was invented, life has never been the same again. The ability to transfer something we want to say onto a physical object, which can be read in a place where we can’t be in person, makes a fundamental difference to human interaction. It is one of the basic features of civilization. And because written things can have a longer lifetime than humans, our words can be read even after we are dead, so that humans, uniquely, have a sense of their own past. It’s a sad fact that writing was devised not to write poetry, or love letters, but to keep accounts. But the ever-resourceful Sumerians, who knew a bit about luxury and refinement, soon adapted it to better things. The earliest literature found so far comes from a Sumerian city not far from Nippur, now in the Maysan province of Iraq. We don’t know its original name, but today people call the mound that covers it ‘Abu Salabikh’, which means ‘father of clinker’. 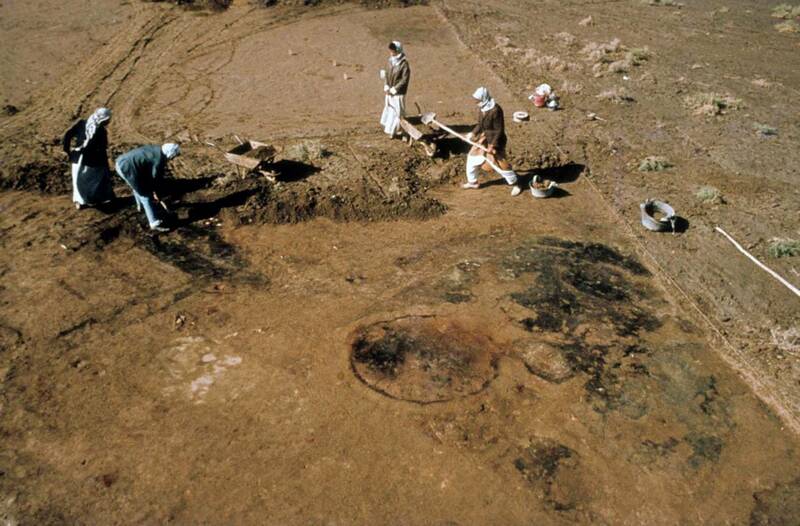 The mound is littered with potsherds, like most Mesopotamian ancient sites, and because of the severe salination of the ground (the downside of all that Sumerian irrigation), only the sherds that were accidentally overfired to clinker have survived. 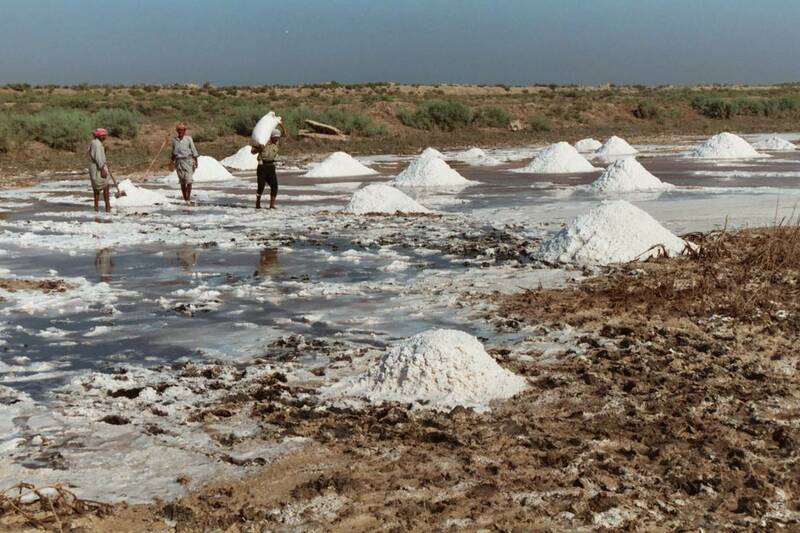 Salt on the surface of the ground near Abu Salabikh. Under this inauspicious surface, expeditions first from Chicago (1963-65) and then from the UK (1975-89) found a whole city, occupied from Uruk times and finally abandoned around 2,000 BC. 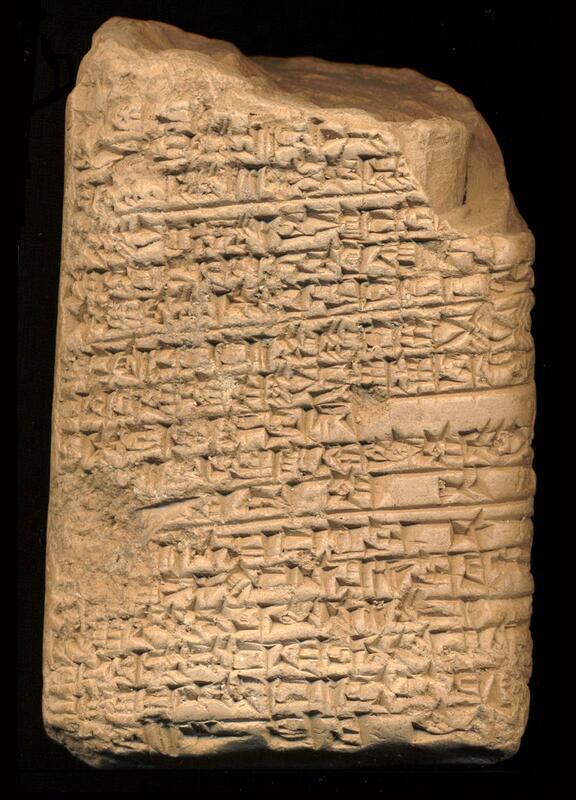 Work concentrated on the Sumerian levels (c. 2,900 to 2,300BC), and in these were found about 500 clay tablets, including the world’s first literature. Among them were the earliest known version of compositions famous in later times, such as the list of proverbs and wisdom known as ‘The Instructions of Shuruppak’, written in the form of advice to the Flood hero Utnapishtim (also known as Ziusudra, and in the Bible as Noah) from his father Shuruppak. Some of it is a bit obvious: ‘Don’t make a field on a road’, and some of it absolutely ageless: ‘Don’t play around with a young married woman’. Other tablets had school exercises, hymns, and incantations. Excavations revealed monumental public buildings as well as city quarters of narrow lanes and intersecting houses. High-tech methods for detecting buried architecture do not work well on sites like this, so much of the city layout was mapped by simply scraping away the top crust of earth, revealing wall lines and other features underneath. The city was divided into different ‘quarters’ including an area where pottery manufacture was carried out. 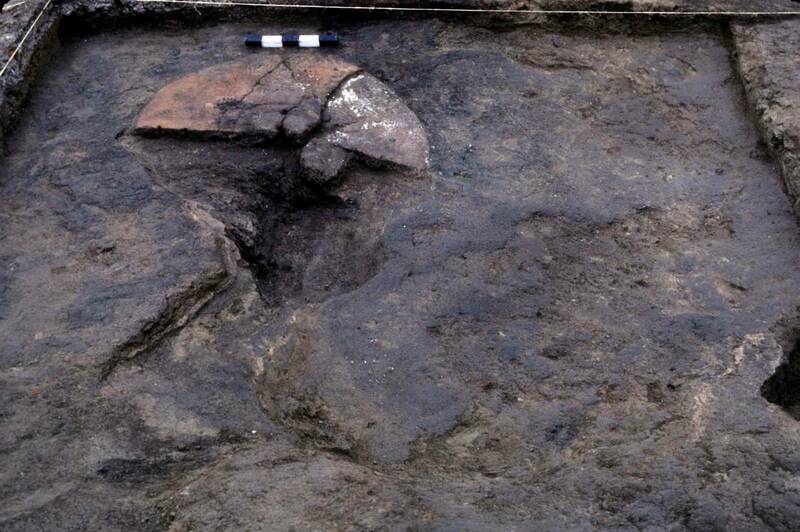 A potter’s workshop was found, with part of the wheel still discernible. The citizens of Abu Salabikh liked to bury their dead under the floors of their houses, equipped for the afterlife with household goods and items of value. Under the potter’s house was the skeleton of an adult, perhaps the potter him/herself! The contents of graves varied according to the status of the deceased, and sometimes even children were richly equipped. 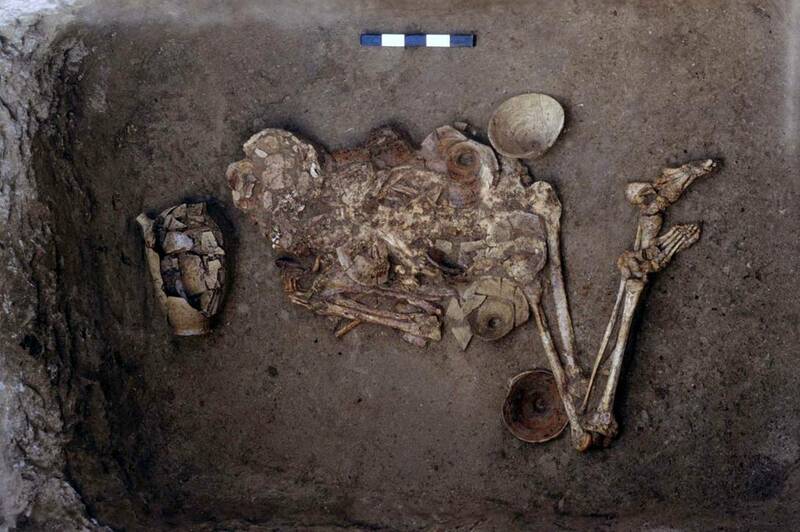 Child’s grave, as found (left) and the miniature vessels after cleaning. Note the double-compartment stone cosmetic jars on the right, and the shells in the foreground – also used to hold make-up. The excavations at Abu Salabikh were a model of interdisciplinary research, using a whole range of different techniques to decipher the material remains left by hundreds of years of city life. 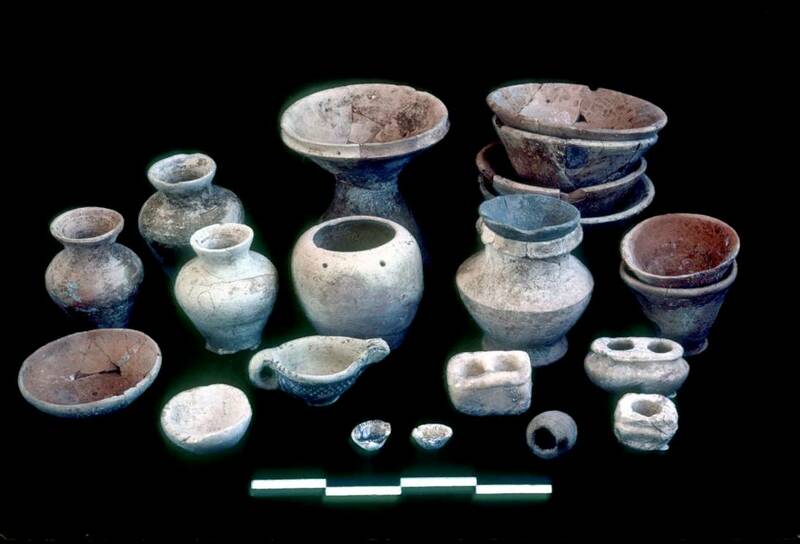 The vast majority of the objects recovered were of everyday things, and the salty conditions meant that few were of spectacular museum display quality, but it is the painstaking research, still ongoing, on items such as these that really gives us insight into the world of early civilization. The tablets and many of the objects from Abu Salabikh were destroyed when the Iraq Museum was looted, but the information they contain is preserved for us, meticulously recorded and published, thanks to that great Sumerian invention, the written word – with a little help from some later ones, such as photography and the internet! It is my honor and pleasure to present a very special guest post. 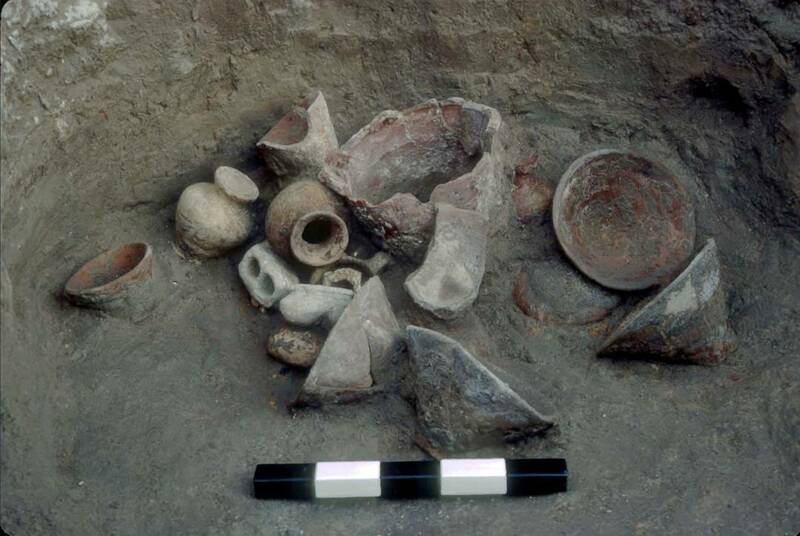 It is not only special because it is our first such post, but also because its author is an archaeologist with a background rich in Mesopotamian knowledge. Dr. Jane Moon is co-director of the Ur Region Archaeology Project (URAP), and an honorary research fellow at the University of Manchester, and one of those people who do wonderful things for Iraq, and in turn, humanity. She was assistant director of the Abu Salabikh project in the 1970s and 1980s, and plans to return to Iraq for further excavations at Ur in January 2013. “We’ve all grown old waiting to get back to Iraq, but I certainly intend to take some youngsters with me, and especially to do what I can to encourage young Iraqis while I am there.” Good luck to Dr. Moon! You can follow Dr. Moon on Twitter- @EaNasir. To learn a bit more about URAP, visit http://www.urarchaeology.org/. This tablet, Tablet #36, is shrouded in mystery. The only sure thing about it is that it is Mesopotamian, that it’s 4,000 years old, and that it bears Sumerian writing. The sureness stops there. Ever since this tablet was acquired in 1929 by the Library of Congress from a private collector, it has given even the most seasoned of Sumeriologists a headache in deciphering its message. 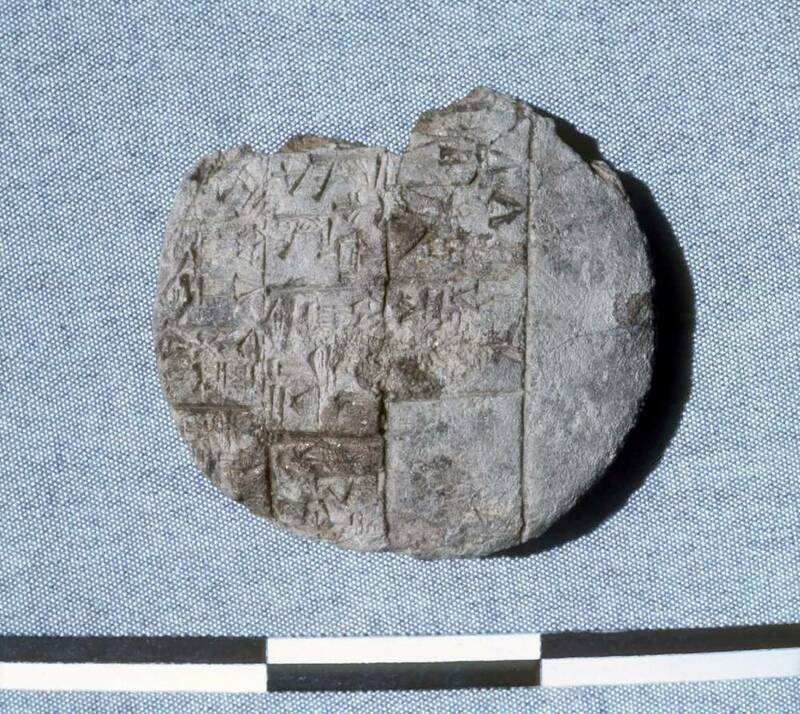 For years, scholars have speculated that it could be anything, from nothing but Sumerian gibberish to an administrative tablet, though in any case, the writing on it is incomprehensible. Enter Jerald Jack Starr, who maintains a website dedicated to Mesopotamian history at www.sumerianshakespeare.com. He has come up with his own theory about Tablet #36, and writes that he believes it is a cryptogram of the world’s first work of literature; a murder mystery, dark comedy and political satire written entirely in code by nothing short of a Sumerian Shakespeare. Starr points to one detail that led him to the idea that the tablet was encoded. That detail is a key, or a hint, inscribed on the tablet itself, which deciphers only one character, much like with today’s newspaper cryptogram-type puzzles. It was that little hint that helped him unlock what he believes is an ancient literary masterpiece consisting of 40 lines, and a missing ending, thanks to damage to that part of the tablet. You might be wondering why a mere story much like any bestseller would be written in code. Starr writes that the reason such a story might have been encoded by its scribe is most likely because of its political satire aspect. I urge you to read Starr’s detailed explanation of how he came to the conclusion that Tablet #36 is a 4,000-year-old literary masterpiece. Just keep in mind that this is one individual’s interpretation of a piece that has baffled many for years.